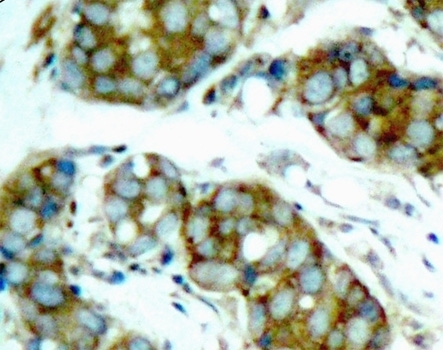 Rabbit anti Cdc25A (pSer76) antibody recognizes M-phase inducer phosphatase 1 also known as dual specificity phosphatase Cdc25A, when phosphorylated at serine 76. Cdc25A belongs to the MPI phosphatase family and is involved in cell cycle progression. Phosphorylation of Cdc25A at serine 76 by STK38 contributes to the degradation of Cdc25A and DNA damage-induced checkpoint progression of cell cycle phase G2 to M (Fukasawa et al. 2015). 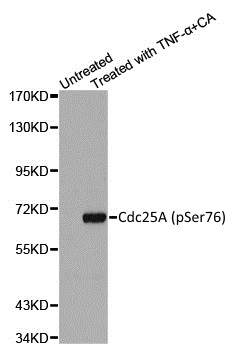 Antiserum to Cdc25A (pSer76) was raised by repeated immunization of rabbits with highly purified antigen. Purified IgG was prepared from whole serum by affinity chromatography. Fukasawa, T. et al. (2015) Serine-Threonine Kinase 38 regulates CDC25A stability and the DNA damage-induced G2/M checkpoint. Cell Signal. 27 (8): 1569-75.